The Name Change service is old news but I continue to be thankful for it every time I log into my hunter. He has a noble name that sounds very elf-like without being something silly like Lolegolas or McBlasty. But that wasn't always the case. I didn't think I'd enjoy playing a hunter and I had no expectation that he'd make it long. I rolled a night elf (I thought 'Dark Elf' at the time), realized he could use two weapons, and named him... Drizzsst. You know. Like Do'Urden. He may have had a Tauren lover that I also rolled named Cattlebree. We had a guild named Underdim. Don't judge me, man, I was only going to play them a little while. But it turned out that I really liked my hunter (including a bat named Bruce) and I played him bunches. And he quickly became my favorite character, even gaining the Lieutenant rank in the old battlegrounds. And I played on a RP server. So you can see the problem. Awesome character, horrible name. The Name Change service fixed all that for me. What about you? What horrible character decisions did you come to regret later in life? Was it a bad name? Or, perhaps, a beard that seemed noble on the dwarf, until you realize it stuck oddly through every helmet and chestpiece you would ever own. Share your painful, irony stories in the comments! Why we're thankful for the Name Change service originally appeared on WoW Insider on Sun, 02 Jun 2013 20:00:00 EST. Please see our terms for use of feeds. To ask why we fight, is to ask why the leaves fall -- it is in their nature. The Alliance and Horde have been notoriously at each other's throats since the two factions began in the days of the First and Second Wars. And although I have come up with some crazy theories regarding the innate reasons behind that latent aggression between the two factions, they're simply theories. They may make sense, in a bizarre and meta fashion, but they are in no way true. So here we are, left with a simple question: What makes the Alliance and Horde so prone to aggression? Why do they continue to battle, and turn their noses at the thought of making peace? While I do enjoy coming up with fanciful reasons for all of this, there is one blatant, simple reason that stands on its own: Misunderstanding. Sheer, unadulterated ignorance and a stubborn unwillingness to try and understand. Both sides possess a single-minded obsession with violence and retribution that has never faded, nearly thirty years after the events of the First War. And when you step back and take a look at the conflict between the two factions with a neutral eye, the whole of the aggression turns into a delightful, tragic, almost laughable comedy of errors and escalation. Let's take a look at where some of the common misconceptions surrounding both Horde and Alliance have gotten us. Know Your Lore: The Alliance and Horde originally appeared on WoW Insider on Sun, 02 Jun 2013 18:00:00 EST. Please see our terms for use of feeds. Code Monkey was first machinima I ever watched. It was also my first introduction to Jonathon Coulton's music. It's a fun song set to a fun video and still one of my favorites. Experienced machnima viewers know that Spiffworld provides all the JoCo love you could ever want in machinima form. Plenty of WoW fans learned about the performer through Spiff's ambassadorial work. WoW Moviewatch: Code Monkey originally appeared on WoW Insider on Sun, 02 Jun 2013 16:00:00 EST. Please see our terms for use of feeds. Meow meow, meow meowmeowmeow meowmeowmeowmeow, meow meow meowmeow meowmeow meow meowmeowmeowmeowmeow. I can't really speculate on what goes down in the next expansion, but yes, you're right in that it's almost certainly not far away. We should expect an alpha/beta not long after BlizzCon and the expansion itself not more than 6 months later, though that estimate relies on 5.4 being released prior to BlizzCon, which may or may not happen. The Queue: Meow originally appeared on WoW Insider on Sun, 02 Jun 2013 14:00:00 EST. Please see our terms for use of feeds. Looking for Group is, unlike many of the other comics, not just a (time-consuming and awesome) hobby. In fact, it has a whole team behind it. A team including personnel with titles like "logistics manager" and "communications director." They are part of the Blind Ferret network. LFG was launched in November of 2006 and has grown to be very popular. It is a fantasy-themed comic that is loosely based on WoW; however, it's very accessible to non-WoW players. It "follows the adventures of Cale'Anon and Richard, as well as their companions." It's story-based but also humorous. The warlock Richard is the primary source of comedy as well as the entry point for readers who don't usually enjoy comics heavy on story. Looking for Group is Canadian. It's written by Ryan Sohmer and drawn by Lar DeSouza. You can read a bit more about them and the rest of the team on their About page. Looking for Group updates Mondays and Thursdays. Sunday Morning Funnies: Looking for Group originally appeared on WoW Insider on Sun, 02 Jun 2013 12:00:00 EST. Please see our terms for use of feeds. You'll have to click on this link to get the full screenshot, because this image from Qwade of Oblivion on Burning Legion (US-A) was so awesome it would literally break our gallery to host it. Qwade plays with a triple-monitor setup, so when he decided to try out the new Armored Bloodwing mount over the Dread Wastes, he was truly able to appreciate the beast's gigantic wingspan. But is it a wingspan worth $25? That's for you to decide. Around Azeroth: Triple threat originally appeared on WoW Insider on Sun, 02 Jun 2013 10:00:00 EST. Please see our terms for use of feeds. Blizzard recently released the Armored Bloodwing mount in the Blizzard store. I don't know about you, but I've seen quite a few out in the wild, with some of them just hanging around big cities, showing off. This mount is not quite to my taste -- I'm a huge sparkle pony fan -- but I like its aesthetic and I see the appeal. Other than the Celestial Steed, I also bought the Wind Rider Cub plushy and in-game pet set. And the Spousal Unit has the Winged Guardian mount. (I think he's eyeing the Armored Bloodwing too. Hmmm. Father's Day is coming up ...) In addition, we each have the collector's editions for several years and all the pets included there. Continue reading Breakfast Topic: Do you buy in-game items at the Blizzard store? Breakfast Topic: Do you buy in-game items at the Blizzard store? originally appeared on WoW Insider on Sun, 02 Jun 2013 08:00:00 EST. Please see our terms for use of feeds. While getting ready to feature Welcome to the Deadmines, Alex Ziebart and I had a brief conversation about the lore of that classic dungeon. We felt it a shame that Vanessa VanCleef was unceremoniously murderized by the players as they completed the storyline. At first, I thought my regrets at Vanessa's death centered on losing a cool NPC. But the conversation's been on my mind and I kept mulling it over. And then the real reason Vanessa's death bothered me finally became clear. Vanessa VanCleef was the story the Alliance needed, and it was the one we deserved. Vanessa VanCleef's story was amazing. We need the VanCleefs back. I'll summarize the story for folks who maybe don't read quests or play Alliance. But keep in mind: all of this played out in World of Warcraft. You didn't need to play any game besides WoW or read anything except quests to see this entire story. Vanessa VanCleef should come back from the dead originally appeared on WoW Insider on Sat, 01 Jun 2013 20:00:00 EST. Please see our terms for use of feeds. Let's keep this cartoon nostalgia train rolling, folks! Arms of Hades - The Touch is another 80s cartoon inspiration from David Nguyen, who was originally inspired by those amazing folks in Fifth Element. I'd say he's more than picked up his own steam now. On the off chance you don't know the original, take some time and enjoy this epic scene from Transformers: The Movie. As a legit child of this era who remembers The Touch very, very well (and may even have danced to it at a homecoming), I'm forced to stand in awe and quietly salute you. Very well done, sir. You've got the touch. WoW Moviewatch: Arms of Hades - The Touch originally appeared on WoW Insider on Sat, 01 Jun 2013 18:00:00 EST. Please see our terms for use of feeds. The ridiculous dependence on crit to the exclusion of pretty much all other DPS stats for fury. Warrior tank threat/DPS and how it holds back the class. The ridiculous amount of hit on Throne of Thunder gear. Why I'm still annoyed that haste does nothing for protection warriors. I know I've been flogging that haste for protection horse for a while, but it just irks me to see two of the plate classes getting solid use out of haste/expertise or haste/mastery gear for their tank sets and we get nothing. Considering point #2 for warrior tanks (namely, that our DPS and thus threat is just way behind the other tanks) I find it absolutely maddening to see haste be so completely useless for protection warriors. It doesn't give us resources at all, due to the way rage regenerates in Defensive Stance - it doesn't even help us with our rage generators like Shield Slam and Revenge because haste does nothing for our GCD. I took a pair of haste legs for my tank set recently (they were still a huge upgrade, that's how bad my old tank legs were) and every time I look at that haste on them, and know I can't reforge all of it away, I get this lump in my gut where the snarky itemization elitist in me says haste? Really? I hate that guy. I hate him even more because I know he's right. Haste has no business on my tanking gear because haste does nothing for a warrior tank. Nothing. We don't even generate rage from our autoattacks, so the miniscule increase in attack speed doesn't even avail us. The Care and Feeding of Warriors: Itemization Concerns originally appeared on WoW Insider on Sat, 01 Jun 2013 16:00:00 EST. Please see our terms for use of feeds. Bats are clearly the superior totem animal, as proven by the absolute dominance of Batman over every other superhero ever. So while we were canvassing your intrepid WoW Insider staff to find out what thye're doing with our weekend, we had to ask about bats. Is the Armored Bloodwing the coolest mount ever, or just the coolest mount to exist so far? Also, if you somehow believe the Armored Bloodwing isn't the final word in best mounts ever, what mount tickles your fancy? What about you folks? When you feel that gripping need for speed, which mount is your go-to choice? No matter what you choose; no buzzing the tower. WRUP: In the Arms of a Bat originally appeared on WoW Insider on Sat, 01 Jun 2013 14:00:00 EST. Please see our terms for use of feeds. Commenter JeffLaBowski requested this video as today's header, and I'm happy to oblige. 5.3 content seems a little "light" dose this mean we can expect 5.4 to drop quicker then other patches? Not necessarily; you should expect to wait about as long as the wait between 5.1 and 5.2 for 5.4. 5.1 was another smaller (read: non-raid) content patch and it came out pretty swiftly as well. Look for 5.4 around the end of summer. The Queue: Rescue Me originally appeared on WoW Insider on Sat, 01 Jun 2013 12:00:00 EST. Please see our terms for use of feeds. With all the recent brou-ha-ha, it sometimes seems like nothing can bridge the gulf between the Horde and Alliance. Nothing ... except the love of a good bike. Submitter Killswitch on Moon Guard (US-H) took this picture at Moon Guard's server-wide Memorial Day event to commemorate the lives lost in the war between the Horde and Alliance, as well as the significantly less fun wars here on Earth. You know it's not a PvP server when things like this don't turn into a complete bloodbath. Around Azeroth: I just want to ride my motorcycle originally appeared on WoW Insider on Sat, 01 Jun 2013 10:00:00 EST. Please see our terms for use of feeds. I admit it: I've been the first domino in guild-killing guild drama. It wasn't anything I said or did that set off the firestorm. But over the course of, oh, nearly 15 years of guild-based MMOs, my curt and final departure from two utterly dysfunctional guilds was most definitely the event that precipitated a cascade of drama leading to the spectacular implosion of both groups. Breakfast Topic: Have you ever been the cause of guild-killing guild drama? originally appeared on WoW Insider on Sat, 01 Jun 2013 08:00:00 EST. Please see our terms for use of feeds. So, what's up with that dragon in Ahn'Qiraj? What's so wrong with WoW? Weekly news roundup with Panser of TradeChat originally appeared on WoW Insider on Fri, 31 May 2013 20:00:00 EST. Please see our terms for use of feeds. It's been a long time coming, but the Warcraft movie may finally be filming in the first quarter of 2014. Producer Charles Roven told Slashfilm of the 2014 date, so there's a good chance we'll see Warcraft on the big screen by 2015 -- the release date that was floating around when Duncan Jones was announced as the movie's director early this year. As to the details of story or casting, no one knows anything for sure -- but with filming starting in 2014, we're bound to find out more details soon. Thanks to readers Craig and Timothy for the tip! Warcraft movie to finally start filming in early 2014 originally appeared on WoW Insider on Fri, 31 May 2013 19:35:00 EST. Please see our terms for use of feeds. Well, even more imaginary, I guess. Technically all of World of Warcraft is imaginary. But this post on the EU forums got me thinking: what kind of cool class mounts do I wish existed in the game? What with the Armored Bloodwing up for grabs in the Blizzard Store, I guess I have mounts on the brain. For warriors, I want a mix of the fanciful and the gritty. I want an armored rhino mount. Something like the Wooly White Rhino, but with armor plates all over it, so heavily armored that it looks like a mound of metal coming to gore you. Like a rhino wearing Onslaught. A rhino wearing Onslaught with Christopher Lee's album playing in the background. Some classes also come to mind - hunters should get to tame a mount, shaman should get a huge elemental ascendant version of a racial mount (so orc shamans would get a stone worg, while draenei would get a fire elekk and so on) and priests should get angel wings (or in the case of shadow priests, dark angel wings) like Imperius from Diablo III. So what are your suggestions? What class mounts would you like to see? My favorite imaginary class mounts originally appeared on WoW Insider on Fri, 31 May 2013 19:00:00 EST. Please see our terms for use of feeds. Welcome to a WoW Moviewatch Staff Picks special! Each of our staff members will get the chance to feature one of their favorite videos, and tell us all why they love it. Mr. Ziebart goes first, and he chose: Welcome to the Deadmines. This is what Alex had to say about the video. Welcome to the Deadmines was released before Cataclysm's remix of the dungeon. The first iteration of the Deadmines was near and dear to people like me, who had been playing the game since launch. Not only is Welcome to the Deadmines an excellent piece of machinima on its own, but it kicked me in the nostalgia, too. Something about this video makes me want to dive right into Van Cleef's stomping grounds. Created by legendary machinima stars like Adrian Drott, Jesse Cox, Irdeen, Matt Greenburg, and more, Welcome to the Deadmines packs one heck of a talented punch. WoW Moviewatch Staff Pick: Welcome to the Deadmines originally appeared on WoW Insider on Fri, 31 May 2013 18:00:00 EST. Please see our terms for use of feeds. "Na na na na na na na na, batmount!" Throgg cried as he cruised the Armored Bloodwing in for an impressive landing. At least, impressive was probably Throgg's plan. In reality, the bat faceplanted into a bush with the grace of a hyperactive dwarf. "What was that all about?" Lolegolas asked, watching the hefty orc pick himself up from the ground. "Still getting the hang of that," Throgg muttered, swatting an errant leaf from his sinewed thigh. "Handles a little tight. The echo-location must be off. Which is funny because you wouldn't think locating echoes would be difficult for a bat." For its part, the bat seemed nonplussed. "Seriously, Throgg," the blood elf countered. "What in the heck is that thing?" "What? Are you Alliance? Are you a gnome or something? What in the Twisting Nether do you think it is?" Throgg asked incredulously. "It's an Elune-praised bat mount." "Thanks for that," Lolegolas muttered. "There's bound to be bat-complaints now." Item Note: You can't have a bat mount without a few good bat-jokes to set up the bat-weekend. This bat mount is available in the Blizzard bat-store. Phat Loot Phriday: Armored Bloodwing originally appeared on WoW Insider on Fri, 31 May 2013 17:00:00 EST. Please see our terms for use of feeds. Blizzard has at long last announced the official release date for the anticipated Book of Tyrael: October 1, 2013. The Book of Tyrael will cover many important events in Sanctuary's history through the eyes of the Archangel Tyrael, someone you should recognize if you're familiar with the Diablo franchise. In it, Tyrael will reveal many secrets of the world, the dangers it faces, and the reasons behind his own actions. Not much in the way of previews is yet available - the cover is up at the link for you to appreciate - but I am certain that The Book of Tyrael will be choc full of beautiful artwork. With supplementary materials like this, Blizzard always delivers. It's the main reason I keep buying the expansion collector's editions: I want those books! 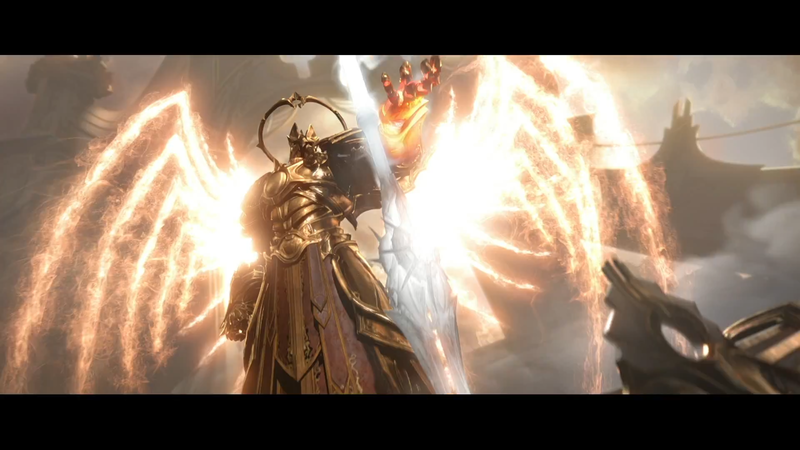 The Book of Tyrael will certainly be a fine collector's item for fans of the Diablo franchise. Are any of you readers Diablo lore junkies? If so, this should certainly answer many of your questions (and probably raise a few more, as well)! Editor's Note: Corrected the original date. Book of Tyrael to release this October originally appeared on WoW Insider on Fri, 31 May 2013 16:00:00 EST. Please see our terms for use of feeds. At the Cowen and Company Technology, Media and Telecom Conference this week, Take-Two Interactive's chairman Strauss Zelnick told crowds that MMOs just don't work in North America. "How many MMOs have been successful in the US?" Strauss mused. "Two: World of Warcraft and EverQuest." This is why Take-Two is focusing on Asian markets for its own massively multiplayer games and why, Zelnick suggested (without mentioning anyone by name), Blizzard had to reboot development of their own Project Titan. However, while WoW's numbers have had a much-ballyhooed decline, its current 8.3 million subscribers is nothing to sneeze at. But does America's poor track record with MMOs mean Titan is doomed before it's even managed to get a release date? Zelnick and Take-Two seem fairly certain MMOs don't have a future, but we intend to wait and see. MMOs don't work in the US says Take-Two Interactive originally appeared on WoW Insider on Fri, 31 May 2013 15:00:00 EST. Please see our terms for use of feeds. One of the major things about World of Warcraft, and any game in general as it ages, is the ability for new players to pick it up and run with it. If a game isn't newbie friendly, then there's less ability to attract growth. Throughout WoW's lifetime thus far there have been major changes in the gaming demeographic and expectations therein. For instance, MMOs were once considered hard and somewhat unapproachable. WoW did a lot to change the opinion of that, and we're now seeing new MMOs pop out of the woodwork every few months. This isn't a bad thing either -- the bigger the marketplace, the better the competition and the better games we all get. But with that said, those other games are developing better ways for new players to get involved. That means that WoW constantly has to evolve in order for it to attract new players. And that's where the heart of the matter lies. Has WoW evolved enough to attract the next generation of players? Before we draw any conclusions, let's break it down into a few areas of concentration to help us figure out if WoW is still newbie friendly. From Graphics to Community: Grading the newbie experience in WoW originally appeared on WoW Insider on Fri, 31 May 2013 14:00:00 EST. Please see our terms for use of feeds. Welcome back to The Queue, the daily Q&A column in which the WoW Insider team answers your questions about the World of Warcraft. Matthew Rossi is fielding your questions and statements today. I'm not talking about some new WoW boss. The Monster with 21 Faces is the name of a villain from a series of novels by Japanese mystery author Edogawa Rampo. However, imagine if someone started actually committing successful crimes while calling him, her, or themselves the Joker and you'll have what happened in the case of the Monster with 21 Faces. You see, someone really did commit crimes using that name, almost 20 years after Rampo's death, and whoever they may have been the Monster with 21 Faces was never caught. The Monster with 21 Faces targeted two of the biggest names in food production in Japan, including kidnapping the head of Glico Morinaga, sent mocking letters to the media and press, successfully laced food with extremely toxic substances, and in short behaved, again, exactly like the Joker. They only stopped their unusual criminal rampage when the police superintendent of Shiga Prefecture committed suicide by burning himself to death. The case has remained unsolved to this day. Anyway, how's about that World of Warcraft? Has anyone else, especially melee, had problems trying to click on things that are somewhere else since the new patch came out? I've noticed it especially on the blobs in Primordius (every time I try to attack one, it says that I'm not facing the right direction or that I'm too far away) and in pick up dead fish quests in Golden Lotus dailies. It isn't a lag issue, as my latency is the same. It's just super disorienting and frustrating, as I like to be precise with my movements and attacks. Yes, I have had this happen to me. It was happening all last night during raid, actually. Other raiders seemed to be DCing a lot around the same time, but I have no idea if it was connected, and no idea what causes it or if it's a bug or an addon or what have you. The Queue: The Monster With 21 Faces originally appeared on WoW Insider on Fri, 31 May 2013 12:00:00 EST. Please see our terms for use of feeds. Spoiler alert: They're both masks. "My character had been feeling a little sick one day while walking along the Serpent's Spine," writes submitter Burkendah of Revelations on Blackwing Lair (US-H). "But he didn't he would start looking that bad. Considering that he is a resto druid, he should be able to handle whatever ailment is affecting him. But a professional second opinion from a doctor wouldn't hurt." Around Azeroth: Which is the mask and which is the face? originally appeared on WoW Insider on Fri, 31 May 2013 10:00:00 EST. Please see our terms for use of feeds. I have two duos going right now. I'm playing a mistweaver with The Spousal Unit's brewmaster and I'm playing a windwalker with The Spawn's frost mage. Both are good times but very different. My daughter and I are leveling very slowly. We stop to smell every peacebloom and sometimes the only questing we get done are the Ironforge cooking and fishing dailies. But we're having a great time tooling around on my two-seater rocket and generally being silly. The duo with The Spousal Unit is completely different. We're speeding through dungeons on our monk experience buffs and he's definitely a GOGOGOer. I prefer a slower pace -- enough to actually see my surroundings rather than just running from place to place watching health bars. But he wants to get through as many instances as possible in a session. This has led to some discord, but for the most part we are happily GOGOGOing. Are you playing with a significant other, sibling, parent, or child? Or are you the lone WoW player in your family? Or do you purposely not play with family because of possible out-of-game drama being brought in game or vice versa? The family that plays together stays together? Maybe? Let us know. Breakfast Topic: Do you play WoW with a family member? originally appeared on WoW Insider on Fri, 31 May 2013 08:00:00 EST. Please see our terms for use of feeds. Last week, Blizzard was looking for feedback about possible changes to elemental and mechanical pets. This week, they have some proposed passive effect changes for patch 5.4 about which they'd like player responses. The Magic passive now caps damage taken at 35% of maximum health, buffed from 40%. The Dragonkin passive effect now activates when the enemy is taken below 50% health, up from 25%. The Aquatic passive now reduces DOT damage by 50%, up from 25%. The Elemental passive effect now only affect negative, direct effects of weather (e.g. the accuracy reduction of Sandstorm won't be applied, but the damage reduction will). The Critter passive now makes critters completely immune to roots, stuns, and sleeps. Keep that feedback rollin' in! Most of these look like pretty big buffs, but do battle pets need to be tweaked anymore? If you have an opinion, head over to the official forums and let Blizzard know what you think. Blizzard soliciting more pet battle feedback originally appeared on WoW Insider on Thu, 30 May 2013 20:00:00 EST. Please see our terms for use of feeds. Over on the Hearthstone official site, a new shaman minion card has been revealed: the Earth Elemental, and it's designed to deal crushing blows to its opponents. This minion has a truly mountainous amount of attack power and health compared to its mana cost. Be careful, though, its Overload ability reduces your available mana for the following turn, which could make the going a bit rocky! To avoid this, you can pair the Earth Elemental with complementary cards such as the Ancestral Spirit, which will bring it back to combat without incurring the penalty and help to crystallize your victory. As a bonus, the preview also details another card that works well with Ancestral Spirit, but you'll have to rock up the page yourself to find out what. Now, if you'll excuse me, I'm going to run away from my computer to hide from the landslide of outrage I fully expect my (word)Play Hearthstone plug to incur! Hearthstone's Earth Elemental card deals a world of pun-ishment originally appeared on WoW Insider on Thu, 30 May 2013 19:00:00 EST. Please see our terms for use of feeds. Today's machinima from Lagspike Films is one you've probably seen before. Released just a few weeks before the launch of Cataclysm, An Inconvenient Expansion brings the climate change discussion to Azeroth in a humorous way. I remember when this machinima was first released, I was suspicious that I might be watching something I would hate. I've found discussing real world issues with WoW players often ends in disaster so I was wary when I saw a character, named Al Boar, correlating the rise in global temperature to the rise in vanity pets. To my pleasant surprise though, the whole machinima never really gets too serious and the script is quite funny. Beyond that, I love the animation in this video. When things really get started I found myself impressed with a lot of little things ... From the way the grounds splits open, to the way Deathwing's silhouette perches atop a mountain. It looks great without a lot of attention being directed toward it. WoW Moviewatch: An Inconvenient Expansion originally appeared on WoW Insider on Thu, 30 May 2013 18:00:00 EST. Please see our terms for use of feeds. As soon as your character hits level 5, it's time to pick up a profession -- or two or three! Each character you have can take two primary professions -- herbalism, mining, skinning, alchemy, blacksmithing, enchanting, engineering, leatherworking, tailoring, jewelcrafting, or inscription -- as well as however many secondary professions -- cooking, fishing, first aid, and archaeology -- they want. Primary professions are typically categorized as "gathering" professions -- herbalism, mining, and skinning -- that allow you to collect materials and "crafting" professions -- alchemy, blacksmithing, enchanting, engineering, leather working, tailoring, jewel crafting, and inscription -- that allow you to create items. When choosing a primary profession, it's good to pick two that work well together: say, a crafting skill that uses the items you collect with a gathering skill. This means herbalism is typically paired with alchemy or inscription; mining is typically paired with blacksmithing, jewelcrafting, or engineering; skinning is usually paired with leatherworking; and enchanting and tailoring can be paired with anything (though often players will pair them together and use goods created by tailoring to level their enchanting). But if you aren't terribly interested in crafting or just want to give your character a leg up with money-making, you could pick up a pair of gathering professions and take whatever you gather while you're leveling to sell to crafters on the auction house. As to secondary professions, since you're not limited on the number you can take, you can really grab as many as interest you. Not sure where to start with all these choices? We'll walk you through it. A beginner's guide to WoW's gathering professions originally appeared on WoW Insider on Thu, 30 May 2013 17:00:00 EST. Please see our terms for use of feeds. Our friends at Wowhead seem to have caught Hearthstone fever -- and, really, who can blame them? In addition to the site's very handy WoW data, they've added a new Hearthstone section that has a database of cards for you to search. Obviously, no one has access to a Hearthstone client, so Wowhead is pulling this info from datamining -- which means it's incomplete and may contain errors. And, of course, with the game not even in beta yet, everything you see now is still subject to change; maybe even a lot of change. However, with a database of just over 500 cards already on the site, it's a pretty impressive collection and a great way to get an early look at the game. The Hearthstone section lets you search for cards and, when you've found one you're interested in, displays card artwork (and the artist), type, quality, class, set, casting cost, special abilities, and health and attack for cards that have it. And, like the rest of Wowhead, each card has its own comments section -- though we haven't run into any cards with comments so far. So while we continue to wait for our beta keys (they're in the mail, right, Blizzard? ), we'll be sure to be prepared by checking out all of the cards on Wowhead. Wowhead launches Hearthstone section originally appeared on WoW Insider on Thu, 30 May 2013 16:00:00 EST. Please see our terms for use of feeds. You might think that World of Warcraft, being a mere video game, couldn't possibly influence the development of the world's most popular operating system. However, there are enough WoW players -- and other gamers -- running Windows that this isn't the case. Microsoft programmer Raymond Chen reports that Microsoft changed the way certain hotkeys work at the request of numerous gamers. The issue? People gaming in full-screen could, quite easily, accidentally hit the "Windows" hotkey that fired up a program in their Start menu that would pull them out of the game and into something completely different. And in the time it takes for the new program to launch and you to alt-tab back to your game, you're stuck doing a corpse run. Now that's some thoughtful programming! Thanks to reader Skelnik for the tip! How World of Warcraft has influenced the development of Windows originally appeared on WoW Insider on Thu, 30 May 2013 15:00:00 EST. Please see our terms for use of feeds. What do you think of the addition of the Armored Bloodwing? Part of me feels like it's nigh about time for the Blizzard store to gain a creepy-looking sinister sort of mount, because there hasn't really been one before. I'm sure tons of folks are going to be all over this thing. Are you? New Armored Bloodwing mount now available originally appeared on WoW Insider on Thu, 30 May 2013 13:38:00 EST. Please see our terms for use of feeds. @_kaedis Yes, and we have been considering designs along these lines. The design of valor (and the emblems before points) has been an interesting progression. We've gone from many types of emblems to a point system, and then to a system where you could do a week's worth of points in a day, and then to a system where you had weekly caps but to hit them in the most efficient way you had to log in every day, and now (likely and as to be expected) more changes in the future. What exactly theses change will be is up for debate, but diminishing returns is a popular option. The idea is that after each heroic (or after some number of heroics), the amount of valor you'll get continues to decrease to the point of not making it worthwhile at all to run them. This concept could also be applied to raids and other systems that distribute any kind of currency. In the example above the rate of change is linear (200 valor/number of runs), however in practice the rate of change would likely be piecewise (the rate not determined by a function, but by set values the designers choose that are loosely based on a function), and also it'd probably have minimums so running heroics would never return virtually zero valor. It's an interesting exercise to write numbers down on paper and see what the best way to reward valor for yourself would be. For me a 1/x curve with a lower-bound limit of 33% feels about right (ie: the lowest valor you'd get for running a heroic would be 33% of normal valor). As with most things Ghostcrawler, please be aware that his insights should often be taken as an academic discussion of WoW's design. Don't try to suss out truths and what the future of WoW will hold. Instead use them as interesting bits into the minds of the designers, realizing that the final product of WoW comes from hundreds of ideas from hundreds of people. Diminishing returns on valor instead of a cap? originally appeared on WoW Insider on Thu, 30 May 2013 13:00:00 EST. Please see our terms for use of feeds. In the results of last week's Blog Community Topic, many people included wish lists for changes to World of Warcraft along with what they felt was wrong with the game. there were quite a few good ideas, but not really related to the topic. So this week, we want to know what is your list of the top three features you would like added to WoW. Personally, I'm rather happy with the game as it is, but I still have a wishlist of things that would make my experience in Azeroth even better. I would like Blizzard to provide one free server transfer a month per account. It seems to me that many people are quitting the game because they can't afford the $25 to move their characters to a higher population server. Also, quite selfishly, I have some characters that I'd like to move to Zangarmarsh, our It came from the Blog guild server. And while I've paid to transfer characters there before, I really can't afford to keep shelling out the dough. I think this change would go a long way toward keeping people happy and still playing the game -- which is good for everyone. Continue reading Community Blog Topic: What 3 features do you wish WoW had? Community Blog Topic: What 3 features do you wish WoW had? originally appeared on WoW Insider on Thu, 30 May 2013 12:00:00 EST. Please see our terms for use of feeds. Welcome back to The Queue, the daily Q&A column in which the WoW Insider team answers your questions about the World of Warcraft. Anne Stickney (@Shadesogrey) used to work in a zoo. You know, I was perfectly aware that elephants could paint, having worked at the San Diego Zoo before. But I didn't realize they were also happy enough to play the harmonica if given the opportunity. Q. If I upgrade a BoA archeology item (such as the Umbrella of Chi-Ji) will it become soulbound as the UI warns or does it stay account-bound only? It will remain account-bound. Feel free to upgrade it and send it to your alts! The Spear of Xuen is a particularly good upgrade, for characters that can use polearms. The Queue: He's just so happy originally appeared on WoW Insider on Thu, 30 May 2013 11:00:00 EST. Please see our terms for use of feeds. Around Azeroth: Good grief! originally appeared on WoW Insider on Thu, 30 May 2013 10:00:00 EST. Please see our terms for use of feeds. When we first spotted the evocative Hordeblood series of custom miniatures by Dave from Wargaming Tradecraft (thanks, Joe! ), we were suitably impressed. And then we wandered into the wilderness of Dave's seemingly endless how-to resources for miniatures hobbyists. And then we heard about Headshots from the Heart, his online gaming charity event benefiting Child's Play. And then I was like, "Heeey, wait a minute. So who is this Dave guy? And how come he does so much cool stuff?" Hordebloods miniatures customizer has WoW in his blood originally appeared on WoW Insider on Thu, 30 May 2013 09:00:00 EST. Please see our terms for use of feeds. Still, I'm not so similar to my characters that I think I could handle the work they do in Azeroth. What if I actually possessed the same toolkit of class skills and abilities? I can most assuredly imagine myself as my priest, healing a raid of hardy adventurers. Grace under pressure and rapid triage are strong points for me, and I don't flinch from the unexpected. I wouldn't imagine I'd be traumatized by the horrors of battle. The work of a mage also seems like a solid fit, although I'd prefer to find a useful position off the field of combat. But life as a warrior? Even if I had the physical strength, I'm not sure I could take leaping into melee, day in and day out. Blood and gore at my hand? Not for me. Could you effectively step into your character's shoes in Azeroth? Like my mage, could you get the work done if you could find a non-combat position? Or do you play any characters whose jobs simply aren't a fit in any sense for the real you? Breakfast Topic: Could you step into your character's shoes? originally appeared on WoW Insider on Thu, 30 May 2013 08:00:00 EST. Please see our terms for use of feeds. Last week, we asked "What's wrong with WoW?" After four blog posts and over 300 comments, it is obvious that quite a few people have very strong thoughts on the subject. We specifically asked what people thought were the reasons that World of Warcraft's subscriber numbers were declining, so I'll be highlighting some of the responses that focus on that. Carmelo at Clever Musings touts WoW's age as being its biggest problem. 8 years is a very long time for a game, even though it does change every two years with expansions. I'm sure that some people are leaving to play shiny new games with prettier graphics. Community Blog Topic Results: What's wrong with WoW originally appeared on WoW Insider on Wed, 29 May 2013 20:00:00 EST. Please see our terms for use of feeds. After eight years of World of Warcraft, it's definitely time to shift the goal posts on defining what qualifies a player as being old school. How long does someone have to have played WoW before you consider them a seasoned player? How long before you consider them an old timer? Does having played the game for some period of time give you confidence that a player is probably experienced and knowledgeable about the areas of the game he or she commonly plays? What about you -- how long have you played World of Warcraft? And would you consider yourself an experienced player? How long have you played World of Warcraft? originally appeared on WoW Insider on Wed, 29 May 2013 19:00:00 EST. Please see our terms for use of feeds.